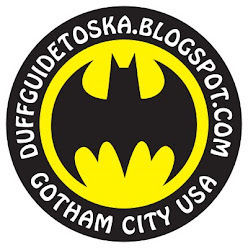 The Duff Guide to Ska: Duff Review/Over the Transom: The Toasters' "House of Soul" single, Dr. Ring Ding's "Kalipso Times" 10", and Solomon Jabby's "Showdown at the Altarsound" single! 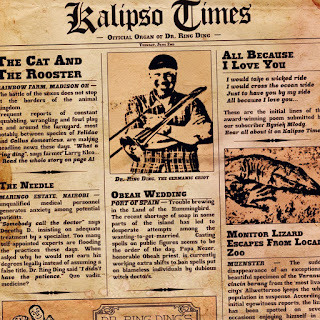 Duff Review/Over the Transom: The Toasters' "House of Soul" single, Dr. Ring Ding's "Kalipso Times" 10", and Solomon Jabby's "Showdown at the Altarsound" single! Editor's note: In an attempt to catch up on the huge backlog of releases that are awaiting my review--and to counter my obsession with solely composing long, in-depth write-ups (something that I just don't have time to do as much as I'd like to, sadly)--I'm launching this new series of brief, paragraph-length reviews. Titled "Over the Transom," my inside joke with Marc Wasserman about sneaking in ska releases and merchandise to our homes without attracting the attention of our respective wives, these batches of reviews are intended to give props to the many bands still recording and issuing great ska music, as well as alert ska fans as to which releases are worth their hard-earned cash. "House of Soul" b/w "Going Home"
While there have been several vinyl LP re-issues of Toasters material on Megalith/Jump Up over the past few years (and the band practically has been on a non-stop tour of the globe), there hasn't been a Toasters release of new material since 2007's One More Bullet (kind of a shock, since I remember the brighter days when each year brought a new Toasters album). This is, no doubt, a reflection of the deleterious impact of illegal file sharing on sales of recorded music rather than an omen of the creative well running dry. 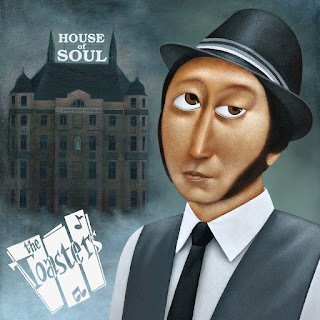 To dispel any worries about that, all one has to do is place the needle on The Toasters' "House of Soul" single, a superb new tribute of sorts to Motown, which will sate the cravings of both newbie and long-time fans for Bucket's patented and beloved NYC ska sound. For a musician now based in (and frequently touring) Europe, it's fascinating to note how these songs are (still) so strongly influenced by 60s black American music (and express deep nostalgia for "old time music," "beat up 45s," and music delivered via mono transistor radios and hi fi sets--all of which are okay by me). "House of Soul" ("Take a boat ride down the delta/and a train right down to Atlanta, too/Take a quick trip up to Chicago, Illinois/To find the home of the rhythm and blues") is another of Bucket's ska history tracks--acknowledging the vital roots of Jamaican ska--that could be the companion track to "Chuck Berry" off Hard Band for Dead. "Going Home" is a ska-via-New Orleans musician's road warrior song ("I've met a lot of people/Ugly, good, and bad....I've broken a lot of hearts/but none of them was mine/Now I'm standing at the crossroads/In the middle of the square/I don't know where I'm going/but it feels like I'm almost there/I'm going home to the one who is waiting for me there"). Good stuff. Bucket says that "House of Soul" marks the first of many new singles from The Toasters--here's hoping that in the near future the band takes more breaks from touring to hit the studio to lay down the next batch of killer tunes! 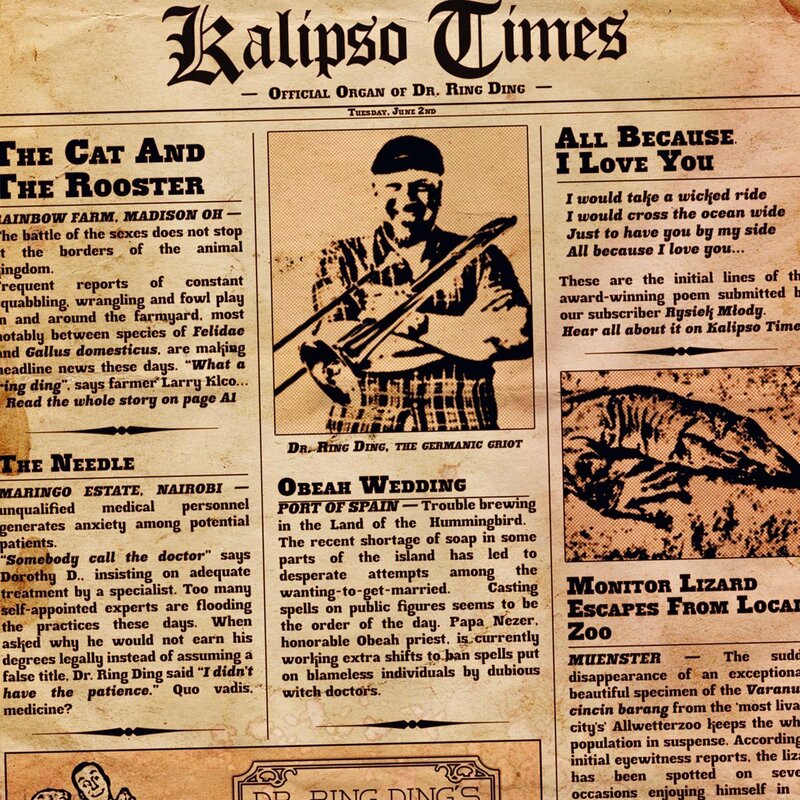 Packed with more slack double entendres that you could shake a...um...stick at, comes Dr. Ring Ding's Kalipso Times EP (which I was able to mail order through Interpunk in the USA). Anyone paying attention to the ska scene over the past two decades will know that the good Doktor is an extraordinary master of vintage Jamaican ska, but his forays into Trinidadian calypso are equally as magnificent. Side A of this EP features an excellent original tune done inna Mighty Sparrow style called "The Cat and the Rooster" (I'll let you work out what we're really referring to here) concerning the struggle for dominance between men and women. More reggae than calypso, "All Because I Love You" is a rather sweet and straight-forward declaration of love and devotion that was also featured on the recent Dr. Ring Ding Ska-Vaganza CD Piping Hot. Side B contains a cover of Might Sparrow's deserved 1966 hit "Obeah Wedding" and “The Needle,"a reggae take on Lord Kitchener's “Dr. Kitch" (also a favorite song to cover by the great and late Judge Dread), which is not exactly about syringes and medicinal injections (both of these tracks have previously been available on a Grover single and Jump Up's release of Dr. Ring Ding's Back and Forth CD). It's all pretty hilarious, in good fun, and very well done. "Showdown at the Altarsound" b/w "Tone Wheel Express"
Though known more for his Christian reggae, Solomon Jabby showcases his early reggae instrumental work on these two fine keyboard-centric tracks. "Showdown at the Altarsound" (Altarsound is the name of Jabby's backyard studio, a la Lee Perry's Black Ark) is an energetic organ workout, while "Tone Wheel Express" is a proud, almost strutting track. Fans of The Aggrolites, The Caroloregians, and 2000 Tons of TNT will be more than pleased to have this single in their collection. You can buy The Toasters 7inch directly from Megalith Records!